Physicians learn early in their education that adopting an ethical position as it relates to treating patients is of utmost importance to their medical practice. They take the Hippocratic Oath as they enter to a lifetime commitment to not doing harm. The expression, “first do no harm,” is often the phrase that comes to mind when we think about a physician’s commitment to their patient’s care. While the phrase doesn’t actually appear in the Hippocratic Oath, it does summarize in a powerful way a physician’s commitment to a patient’s health. 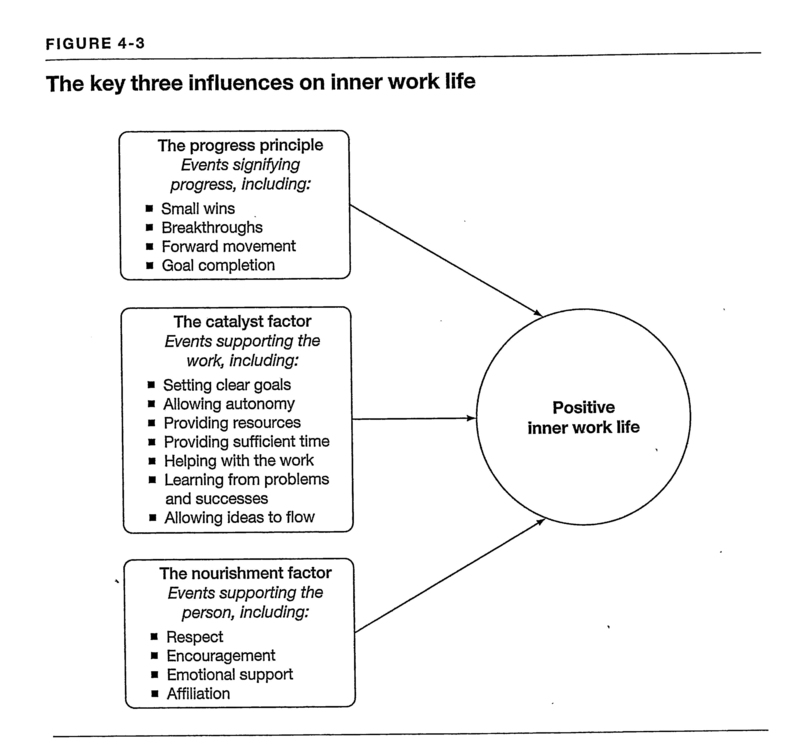 The figure below outlines the factors that impact building a strong inner work life. After compiling data from 238 people, 26 project teams, 7 companies, 3 industries, and 12,000 journal entries they concluded that the progress principle accounts for the productivity of people in their work. However, the influence of setbacks in one’s work are powerful deterrents to developing a strong inner work life. I found important lessons to be learned for school leaders as I was reading this section. While they develop the case for the influence of positive events, they point out that negative events can get in the way of making progress. Their evidence for this powerful idea is quite compelling. Here are some ideas they explore (page 92-93). Small everyday hassles at work hold more sway than small everyday supports. Negative team leader behaviors affect inner work life more broadly than do positive team leader behaviors. In their study, people write more extensive journal entries surrounding negative setbacks than they do with neutral or positive events. There is a strong connection between mood and negative work events than between mood and positive events. Employees recall more negative leader actions than positive actions. It starts with the leader of a school, a division, a department or a team of teachers. My experience tells me that teachers want to know that their efforts are contributing to meaningful progress. Teachers’ continual daily progress, both in the classroom and on teams, contributes to the success of the school and the quality of teachers’ inner work lives. As a school leader, we must consistently facilitate progress, and most importantly, remove obstacles that could potentially “do harm,” harm to a teacher’s inner work life. Leaders need to identify the obstacles unique to their organization and commit focused energy to diminishing their influence.